WorldMovieStore - Marvel's The Avengers Sinopsis. Blasphemy? No, the real appeal of The Avengers comes from the quiet moments among a group of decidedly unquiet humans, extra-humans, mutants, and demigods. In no particular order those are Iron Man (Robert Downey Jr.), Thor (Chris Hemsworth), Captain America (Chris Evans), Bruce Banner/Hulk (Mark Ruffalo), Black Widow (Scarlett Johansson), Hawkeye (Jeremy Renner), S.H.I.E.L.D. world-government commander Nick Fury (Samuel L. Jackson), and indispensable functionary Agent Coulson (Clark Gregg). That's a superstar lineup both in and out of character, and The Avengers brilliantly integrates the cast of ensemble egos into a story that snaps and crackles--not to mention smashes, trashes, and destroys--at breakneck pace, never sacrificing visual dazzle or hard-earned story dynamics. Though at times deadly serious (as deadly serious as an outrageous superhero destructo/fight-fest movie can be, that is), The Avengers is best when it lightens up and lets the fun fly alongside the powerhouse punches. --Ted Fry. Read More Sinopsis. 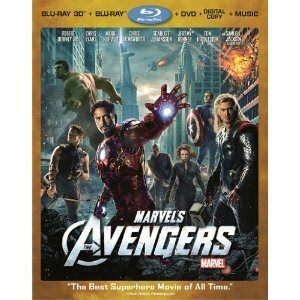 0 Response to "Marvels The Avengers Blu-ray"